One of the fun things I get to do on my time off here at Dr. King’s Farms is play with recipes using bison and elk. I love the flavor of these meats, and I’m always looking for interesting ways to cook them that doesn’t hide the taste. As the weather cools down, I love eating hot soups, stews, and one-dish type meals that stick to the ribs and warm from the inside. 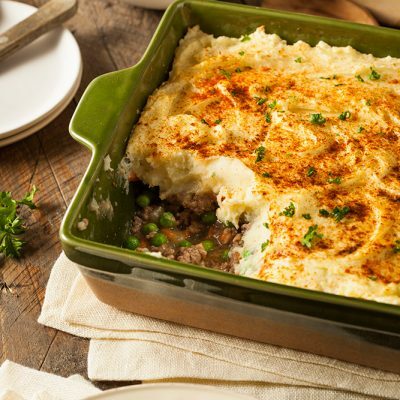 This week I made a truly delicious Shepherd’s Pie (using our ground elk) that everyone raved about. My daughter had three helpings in one sitting! Taking that as an official seal of approval, I wanted to share this recipe with you. Cut the potatoes into quarters and boil with the skins on until soft. Drain potatoes, return them to the pot and mash, adding cream, butter, salt and pepper until they’re exactly how you like them! Stir corn into the potatoes (optional, or add them into the elk mixture later). Set mashed potatoes aside, and preheat oven to 300 degrees. Brown elk in a pan with a little olive oil along with onion, garlic and salt and pepper to taste until onions are translucent and everything smells amazing. Add peas (and corn, if desired) to pan and mix well. Put browned elk mixture into the bottom of a lightly oiled baking dish and spread evenly. Spoon mashed potatoes carefully over the top, smoothing the top with the back of your spoon. Sprinkle mashed potato layer generously with shredded cheese, and cover with a lid before putting in the oven. Sprinkle lightly with paprika for garnish if desired. Bake at 300 degrees for around 15-20 minutes until cheese begins to melt and the potatoes bubble along the edges of the dish. Remove lid from dish and bake another 5 minutes to lightly brown the cheese on top. Then remove from oven and let rest another 5 minutes (that’s the hard part!) before serving. This was a big winner at my house, and using elk instead of beef added an entirely new and fantastic dimension of flavor to a tried-and-true dish. You could also substitute bison in place of the ground elk and it would be just as great. I hope recipes like this will help you on your journey of exploring the world of flavorful and healthy wild meats. Happy cooking!